- probably the cuddliest and most affectionate bunnies you'll ever meet! Welcome to Ross Rabbits - the home of some of the biggest, cuddliest and friendliest French Lop companion pet rabbits you're ever likely to meet! We're a family of bunny-enthusiasts following our long-term +45-year hobby with our pampered family pets living in our home and garden. Today we are proud to be owned by an extended family of large, chunky, cuddly French Lops who have completely taken over our lives - and they know it! 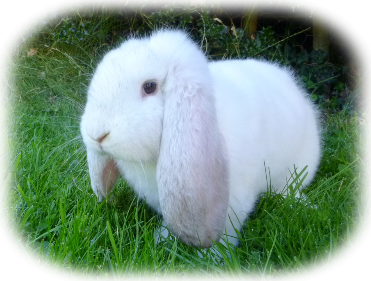 Our website gives information and advice about adopting and caring for pet rabbits, as companion rabbits, with information about what to look for when adopting your new furry friend, choosing your new pet bunny, housing, handling, feeding, grooming, house/litter-training and an introduction to general rabbit healthcare and welfare. We are not a large commercial or impersonal 'stud' but very small-scale, hobbyists breeding occasionally to maintain and improve our lines of over-fussed and pampered, gregarious pet bunnies whom we've bred and raised ourselves over more than 40 years. These produce equally pampered babies, some of whom are adopted and lucky enough to move into some of the most loving homes across the UK. We breed only to maintain our lines and normally produce 2-3 litters per year. 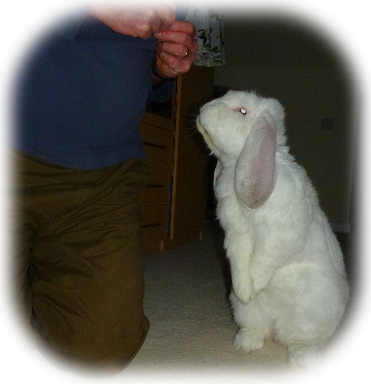 We do not breed for income or profit, nor do we breed specifically to sell - indeed, of our 9 French Lop girls, at least a third are always our elderly or retired 'geriatrics' who remain our much-loved pets and another third are youngsters. We sometimes have some of our bunnies' families available for adoption by loving pet homes only - and these can be seen on our Babies for Sale page. In addition to our family of French Lops, we also have a huge Continental Giant heart-throb boy, Walter, whom everyone who visits us instantly falls in love with. This also applies to his son, Wally, who lives indoors as our house-bunny. Our bunnies maintain an online journal which they think we don’t know about - Read what they get up to at: http://furrymob.livejournal.com. We also grow our own Wrenwood Willow and Raspberry Leaf especially for our bunnies and sell any surplus in our online shop.